SALZBURG — When artistic control of the Whitsun Festival here moved to Cecilia Bartoli nearly six years ago, its programming changed from a steady focus on one period and place (18th-century Napoli) to shifting annual themes. First there was “Cleopatra.” Next came the idea of “sacrifice.” Then the concentrations began to blur, and this year the festival shapes up as a loosely Scottish dog’s dinner — or, bluntly, as the product of whatever the various assembled musicians wished to perform. So, Händel’s Ariodante bookends the plan; La donna del lago in concert allows Bartoli to add a Rossini role without the bother of a staged run; Antonio Pappano’s Rome orchestra essays Mendelssohn’s Third, minutes after Tatiana Serjan has sung Verdi and Bryn Terfel grim Wagner; and Anne-Sophie Mutter marks forty years of stardom playing the Trout Quintet followed by Vivaldi’s Le quattro stagioni. Then again, no one ever wanted four days locked onto Cleopatra. Despite this manifest pliancy, the cheerful impresaria can still be imagined as a someday chief of the main summer festival. She is adored here by the powers-that-be for her business flair, her energy, and especially her tact, and she straddles the Alps north-to-south and south-to-west uniquely. Christof Loy’s staging of Ariodante (1734), new yesterday at the Haus für Mozart, will be noted most for one idea that falls flat. Still, it is conceived so thoughtfully and executed with such command of structure and Baroque methods that the opera’s 190 minutes plus two intermissions sail by. The German director balances the functionality of hard surfaces and painted flats and makes impeccable use of color. He advances the action with every stanza and presents the tenuous plot faithfully — it hinges on one unchecked ruse, a push by the Duke of Albany to thwart fearless knight Ariodante’s marriage to Ginevra, princess of Scotland — even as he indulges his fondness for tidy abstraction; we watch his characters, never quite inside their heads. He inserts hammy antics during coloratura passages, without mocking the music. He brings gravitas where due. He integrates the dances poignantly, applying period style in the sequence at the end of Act I (a gavotte, two musettes and a fast section) but contemporary moves for Ginevra’s nightmare in the darker Act II. And he ties everything together. That one idea? A transgender thread for Ariodante (Bartoli): the woman will emerge in the man. Loy sets this up with a reading at the start from Virginia Woolf’s (1928) Orlando and develops it during E vivo ancora? E senza il ferro? oh Dei! … Scherza, infida, in grembo al drudo — the Act II scena with bassoon obbligato, sung in quaking sadness by the bearded mezzo-soprano — when the knight, seeing himself ridiculed, steps into the love-cocoon of Ginevra’s dress. By the Act III duel, he has shaved. Since neither score nor text offers Loy support, Ginevra must cope with her groom’s alarming transition as if she has long understood. A comic Act III cigar-puffing turn for Ariodante, balancing a 40-proof-drunk scene in Act I, mitigates the director’s blunder. Musically last night’s proceedings fell to the barely known but hardly novice Gianluca Capuano, organist at Milan’s Basilica di San Simpliciano and first dedicated conductor of the year-old, Bartoli-initiated Monegasque Baroque ensemble Les Musiciens du Prince, on duty in the pit. Six impressive principals acted and sang stylishly and with, inter alia, real trills. Nathan Berg’s smooth and agile bass-baritone sounded almost too refined for Loy’s doltish view of the Rè di Scozia. Tenor Norman Reinhardt introduced a keenly musical Lurcanio, Ariodante’s brother; he hands over to Rolando Villazón for the August run. 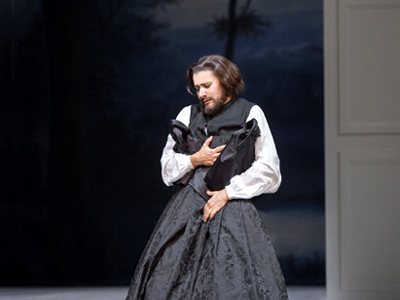 Countertenor Christophe Dumaux impersonated Polinesso, the obnoxious duke, with laudable evenness of tone. Bartoli proved fuller of voice than for Alcina a few months ago, with glowing middle and low tones and only a hint of effort in the liveliest salvos. The two sopranos quashed their Italian consonants but provided compensations, Kathryn Lewek an affecting Ginevra and Sandrine Piau a musically flexible Dalinda, the lady-in-waiting secretly in love with Polinesso, here masochistic. The Salzburger Bachchor made tight, feisty contributions. Andreas Heise’s choreography occupied eight versatile male dancers and at times the singers. Capuano drew the subtlest of textures from Monaco’s musiciens at brisk but never rushed tempos. He balanced the score’s grace with its tensions, not shrinking from bold percussive and string effects. (A larger string body would not have hurt.) His woodwinds provided object lessons in focused restraint; the continuo group sounded tireless. All told, a triumph. If only some of the same could be said of Pappano’s work this afternoon in the Großes Festspielhaus. But fame is no guide. Chronically poor rhythm and misplaced accents ruined the Scottish Symphony (1842) as played by the Orchestra dell’Accademia Nazionale di Santa Cecilia. Despite keeping his nose on the page, the Royal Opera House celebrity showed concern mainly for the music’s surface and imposed sudden ugly accelerations where elements of the dance belonged. Weak ensemble didn’t help him, although standards surpassed those in the concert’s disorderly opening, Mendelssohn’s The Hebrides (To the Lonely Island). Terfel blew away the hall’s remotest cobwebs with Die Frist ist um … Wie oft in Meeres tiefsten Schlund, cleanly accompanied. But then Pappano turned to Verdi, specifically Macbeth excerpts, with little feel for the composer’s micro-phrases, unable to muster a cantabile, and finding mere bombast where majestic swagger was due. Serjan provided a big-voiced Lady Macbeth, singing for twelve minutes in opaque Italian. Terfel, with the Wagner, sang two minutes longer. They did not duet. This entry was posted on Saturday, June 3rd, 2017 at 4:21 am	and is filed under Munich Times. You can follow any responses to this entry through the RSS 2.0 feed. Both comments and pings are currently closed.